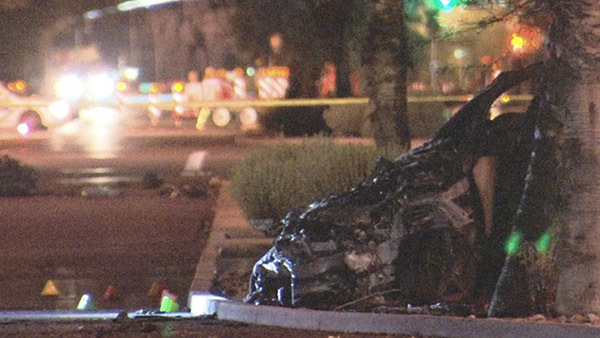 Phoenix, Arizona—An accident on Shea Boulevard near 64th Street left one man dead and another fighting for his life on Wednesday night. Ryman Garvey, age 24, was driving a black Mercedes sedan westbound on Shea when it struck an eastbound pickup truck as the truck turned north onto 60th Place. The Mercedes then hit a tree in the median and burst into flames. Mr. Garvey died at the scene. His front seat passenger, an unidentified 22-year-old male, was pulled from the car with minor injuries. The driver of the pickup, presently identified only as a 28-year-old male, was ejected and transported to a hospital with life-threatening injuries. Shea was closed in both directions from 61st Place to Montrose Way for more than 12 hours. A storm and nightfall hampered rescue efforts. We extend our condolences to the family and friends of the man who died and we wish full and speedy recoveries for those who were injured.